This nine story vintage high rise building was originally constructed in 1926 as the Winthrop Terrace Hotel and later converted to the apartment building you see today. Enjoy the common space p rovided by the vintage parlor and outside patio. 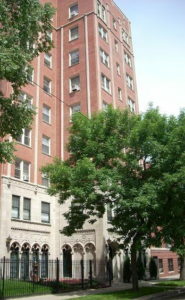 Winthrop Terrace offers several studio layouts of various sizes and prices. The original vintage charm of these apartments was carefully preserved when they were updated with modern amenities, such as wiring for your cable, phone and internet needs. There is a large laundry room in the building as well as outside bicycle storage. All utilities (internet, electric, cooking gas, heat, and water) are included in a monthly utility package for $50. Indoor parking is available at $165/mo. Winthrop Terrace is located in the Edgewater neighborhood just steps away from Lake Michigan, Hollywood and Ardmore Beach, the Lake Michigan Bike Path, grocery stores, restaurants, banks, Starbucks and Loyola University. Transportation to and from Winthrop Terrace is a breeze as the building is conveniently close to the Red Line, Lake Shore Drive and bus routes.